Robots on strike! 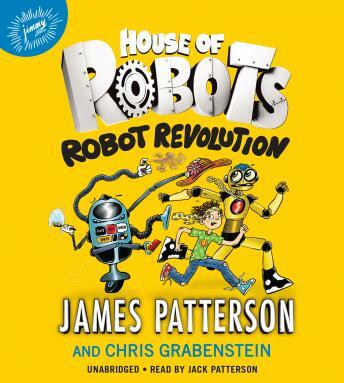 Sammy's underappreciated mechanical helpers are causing chaos in audiobook 3 of the bestselling House of Robots series. After a few early glitches in their relationship, Sammy and his 'bro-bot' E are now fast friends. In fact, E is such a valued member of the family that the other electronic occupants of the House of Robots are feeling sorely unappreciated. And when Sammy's inventor mom becomes distracted by a top-secret project, the robots soon begin to fall into disrepair. Cue a robot revolt, with the droids wreaking harmless havoc in the house! Armed with pranks like glue in the shampoo bottles and flying toast missiles, the robots demand to be cared for. It's up to Sammy and his disabled sister Maddie to keep the peace until his mom reveals her secret project...and why it was worth the wait.